Management of patients with thoracoabdominal penetrating injuries is challenging. Thoracoabdominal penetrating trauma may harbor hollow viscus injuries in both thoracic and abdominal cavities and occult diaphragmatic lesions. While radiological tests show poor diagnostic performance in these situations, evaluation by laparoscopy is highly sensitive and specific. Furthermore, minimally invasive surgery may avoid unnecessary laparotomies, despite concerns regarding complication and missed injury rates. The objective of the present study is to evaluate the diagnostic and therapeutic performance of laparoscopy in stable patients with thoracoabdominal penetrating injuries. Retrospective analysis of hemodynamically stable patients with thoracoabdominal penetrating wounds was managed by laparoscopy. We collected data regarding the profile of the patients, the presence of diaphragmatic injury, perioperative complications, and the conversion rate. Preoperative imaging tests were compared to laparoscopy in terms of diagnostic accuracy. Thirty-one patients were included, and 26 (84%) were victims of a stab wound. Mean age was 32 years. Ninety-three percent were male. Diaphragmatic lesions were present in 18 patients (58%), and 13 (42%) had associated injuries. There were no missed injuries and no conversions. Radiography and computerized tomography yielded an accuracy of 52% and 75%, respectively. 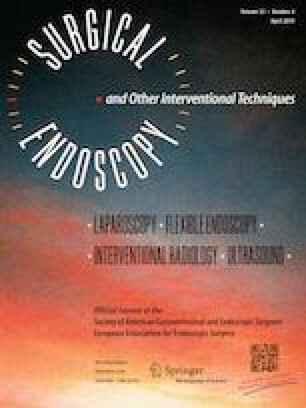 Laparoscopy is a safe diagnostic and therapeutic procedure in stable patients with thoracoabdominal penetrating wound, with low complication rate, and may avoid unnecessary laparotomies. The poor diagnostic performance of preoperative imaging exams supports routine laparoscopic evaluation of the diaphragm to exclude injuries in these patients. The online version of this article ( https://doi.org/10.1007/s00464-019-06761-7) contains supplementary material, which is available to authorized users. We thank Dr. Inês Nishimoto for her invaluable participation in performing the statistical analysis for this study. Authors Carlos Augusto M Menegozzo, Sérgio Henrique Bastos Damous, Pedro Henrique Ferreira Alves, Marcelo Cristiano Rocha, Francisco de Salles Collet e Silva, Thiago Baraviera, Mark Wanderley, Salomone Di Saverio, and Edivaldo M Utiyama have no conflicts of interest or financial ties to disclose.